Forgetting things, feeling incapable, grappling with loneliness, and maybe not enjoying daily life? Aging is inevitable, but these symptoms don’t have to be. Whether you’re noticing them in yourself, or coaching someone who is, here’s what you need to know about the importance of lifestyle and nutrition for seniors — plus 7 effective strategies to live not just longer, but better. When my grandfather’s health started to decline, a simple intervention transformed his ability to live independently. I’ve been coaching nutrition for over 10 years, and teaching university nutrition courses for seven. I’ve seen thousands of people benefit tremendously from the health strategies I share with them. But no transformation has been as dramatic or inspiring my grandfather’s. A few years ago, in his early eighties, my grandfather began to forget things. He missed appointments and misplaced objects like his keys or reading glasses. His appetite decreased, and he started losing weight. One day, he suffered a bad fall. He required hospitalization, and his confusion and disorientation worsened during his stay. It was a low point for my family. A professional medical assessment determined that it was no longer safe for him to live independently at home. He got placed on a waiting list for a long-term care facility. My grandpa’s diet had been poor for some time. I knew he was living mostly on canned soup, chocolate milk, and the occasional banana. Not nearly enough calories, and not a lot of nutrient-dense, whole foods. I wondered what effect that was having on him. So I did some detective work. After running some blood tests, we discovered that my grandfather was very deficient in a range of B-vitamins, particularly vitamin B1, or thiamine. The signs of thiamine deficiency? Low appetite, fatigue, memory loss, and confusion. I suspected that correcting these deficiencies might help my grandpa function better, so I put him on a high-quality seniors’ multivitamin, and recommended a few simple changes to his diet. A week later, my grandfather was transformed. His appetite increased, and he became clear-thinking and lucid. He was released from the hospital, and his medical team approved his ability to keep living independently. Simple nutrition and lifestyle changes can dramatically improve quality of life — even in older adults. That’s why, in this article, we’ll explain what we know about optimal lifestyle and nutrition for seniors: how these habits affect aging; and how to implement healthy changes for yourself, clients, or loved ones. It’s not just the number of years you live; it’s how you live them. Modern medicine can help us live longer, so what’s the point of eating the right foods and taking the right supplements? Well, we don’t want to just live longer. We want to live longer and live well. When we talk about longevity, most of us don’t dream of living for a thousand years in a cryo-chamber hooked up to a bunch of wires that artificially maintain our basic functions. In addition to a long lifespan, we also want a long healthspan — a high quality of life for as long as possible — a state that allows us to travel and enjoy our retirement, to run around with our grandchildren without aches and pains, and to generally enjoy life feeling good in our bodies, minds, and hearts. Good nutrition and lifestyle habits are our best tools to improve healthspan. And while these habits can have a major effect on healthspan if you start them young, making nutrition and lifestyle changes can make a difference even afteryou’ve noticed signs of aging. Now, these changes aren’t going to turn you into an ageless bionic superhuman, but they can certainly help you age better and become more resilient. Which parts of aging are under our control? From the moment we’re born, our bodies begin to change. These changes continue throughout life. …but how and when we age is highly influenced by our lifestyle. Most of us have great bodies at 18 — slim, pain-free, resistant to illness and injury. By 68, we might groan about our soft midsection, our bum knee, or our high blood sugar. We might call these changes “aging”. But much of what we call “aging” is actually very much an accumulation of lifestyle habits. lots of sitting, which allowed those knee-supporting muscles to atrophy. Another 68-year-old who practiced habits like mindful eating, regular movement, strength training, and a nutritious diet might not see those symptoms appear until much later, or perhaps ever. Some health issues occur almost exclusively in advanced age. While many factors contribute to these, lifestyle and nutrition habits can play a role in when, and to what degree, these issues manifest. Arthritis is characterized by inflammation of the joints. Although there are many types of arthritis, the two most common forms are rheumatoid arthritis and osteoarthritis. Rheumatoid arthritis is an autoimmune disorder in which the body’s immune system attacks the joint tissues. This results in pain, swelling, and redness. Osteoarthritis occurs due to the chronic wear and tear of joints, resulting in pain that ranges from minor to debilitating. Risk factors include previous joint injury, obesity, and a sedentary lifestyle. Because inflammation lies at the root of both types of arthritis, consuming a diet high in anti-inflammatory omega-3s and antioxidants may help support a healthy immune system response and moderate symptoms. Alzheimer’s disease is a chronic neurodegenerative condition. Brain cells, or neurons, get damaged, which reduces their ability to communicate. This results in memory problems, mood dysregulation, difficulties with language, and sometimes physical disability. Although Alzheimer’s disease is not fully understood, we know that it tends to run in families, which hints at a genetic link. Some researchers have suggested that Alzheimer’s could be called “Type 3 diabetes” because chronically elevated blood sugar (and insulin) seems to increase inflammation, as well as influence the size/development of the hippocampus (a brain structure essential to learning and memory). In order to preserve brain health, take care of the body as a whole: Exercise regularly, consume a nutritious diet, manage blood sugar, and reduce or eliminate smoking and / or excessive alcohol consumption. Cataracts occur when the lens of the eye gets clouded with clumps of protein or yellow-brown pigment. Symptoms can include blurry vision, trouble seeing with bright lights, trouble seeing at night, and reduced ability to distinguish colors. In advanced cases, a person with cataracts may have trouble driving, reading, and recognizing faces. If left untreated, cataracts can even result in blindness. Age increases the risk of cataracts, as does smoking, excessive unprotected sun exposure, heavy alcohol consumption, and diabetes. Consuming a diet high in antioxidants (which often come from dark green, purple, and orange fruits and vegetables) provides nutrients that keep the eyes healthy. In older age, good nutrition is more important than ever. Older age brings with it special nutrition concerns and requirements. In older age, energy needs decrease but nutrition needs increase. In general, because of the physical and lifestyle changes that tend to go along with aging, the need for overall calories is decreased. However, the need for nutrition, in the form of nutrient-dense, well-absorbed foods and targeted supplementation, is more important than ever. Dehydration risk is higher among older adults. This may be due to side effects from prescription medications, or a reduced sense of thirst (more pronounced in those with Alzheimer’s disease or those who have suffered a stroke). reduces mental performance and increases fatigue. Older adults should consume 2-3 liters of liquids per day in the form of water (ideally), herbal teas, broths, or liquid-based foods like smoothies and soups. Adjust amounts as needed according to medication requirements, if applicable. Use the below chart to assess hydration levels. Note: Certain medications, B-vitamins can darken or change the color of urine. Tip: To increase water consumption, leave written reminders around the house, or set a timer to go off every 1-2 hours during the day reminding you to drink water. For those with mobility issues (who have trouble getting up to drink) or tremors (who have trouble holding a glass steady), have caretakers make water easily accessible, and use appropriate drinking containers (e.g. cups with spill proof lids, or straws to help those with diminished strength or shaky hands). Studies show that people with a high intake of antioxidant vitamins (especially from nutrient-dense whole foods) generally have a lower risk of major chronic disease, such as heart attack or stroke. While most vitamin and mineral needs increase with age due to poor absorption or interactions with medications, some needs decrease. Absorption of vitamin A increases with aging, so vitamin A (retinol) should be avoided in supplement form. In older individuals, getting vitamin A through foods is best. Adults should aim to get about 2,000-2,500 IU of vitamin A per day, from retinol rich food sources like liver, dairy products, and fish. For carotenoids, the plant form of vitamin A, see recommendations below. As we get older, we get less efficient at absorbing vitamin B12, which supports brain and nervous system health. Deficiency is confirmed via blood test. Symptoms include: fatigue, dizziness or loss of balance, and reduced mental function. Adults need 2.4 mcg of B12 a day from food sources like eggs, dairy products, meat, fish, shellfish, poultry, and B12 fortified foods. If supplementation is needed (which can be confirmed by a blood test), opt for B12 options that get absorbed directly into the bloodstream, like injections, or drops/lozenges that dissolve under the tongue. To correct a deficiency, supplement with 1,000 mcg a day until normal levels are restored. Vitamin D is involved in immune system, hormone, bone, and brain health. As we age, our synthesis of vitamin D from sun exposure declines. Especially in northern climates, vitamin D deficiency is extremely common. Moderate sun exposure and vitamin D supplements are recommended, as vitamin D does not occur naturally in high amounts in food. Adults should take between 800 – 4000 IU of vitamin D a day, depending on the degree of deficiency. Because vitamin D is fat soluble, meaning it’s only absorbed in the presence of fat, take supplement with food that contains fat. These vitamins have antioxidant properties and are important for keeping tissues healthy and free from disease. In particular, the lens of eye is easily oxidized, leading to macular degeneration and cataracts. Especially in the case of vitamin E and beta-carotene, avoid supplements, as they have been shown in studies to be ineffective or even harmful, particularly for smokers and those at risk for heart disease. Therefore, it’s best to get these nutrients from food. Carotenoids are rich in orange and yellow colored plants, like sweet potato, squash, and carrots, as well as dark leafy greens, such as spinach, beet greens, or kale. Vitamin E can be found in nuts, seeds, nut butters, and wheat germ. Vitamin C requirements can be easily obtained by consuming a variety of fresh (uncooked) fruits and vegetables every day. We need calcium to regulate heart rate and maintain bone mass, but absorption declines with age. Men and women aged 50 and older should get 1200 mg of calcium per day. Prioritize calcium intake through whole food sources, such as dairy products, cooked greens, and calcium-fortified foods. Iron deficiency can result in low energy, poor concentration, and dizziness. Iron status generally improves later in life, especially in women after menstruation. However, iron deficiency is still possible, usually due to low food intake, chronic blood loss from ulcers or hemorrhoids, poor absorption, antacid use, or the use of certain medications. Men and non-menstruating women should aim to get about 8 mg of iron per day, from red meats; organ meats; clams and oysters; beans and lentils; and cooked dark leafy greens. If iron deficiency is confirmed, supplementation may be required. Caution: Before taking an iron supplement, confirm via a blood test that iron is low. Iron taken in excess of requirements is toxic. If iron deficiency is confirmed, adults should take 10-30 mg of elemental iron 1-3 times a day, depending on the degree of deficiency. Zinc deficiency is common in older people and can depress appetite and blunt sense of taste, making eating less enjoyable. Many medications can worsen zinc deficiency. Adults should try to get between 8-11 mg of zinc a day, from food sources such as oysters; mussels; meat; pumpkin seeds; and beans, peas, and lentils. If diet is restricted or if a person is on medications that deplete zinc levels, supplementation may also be appropriate. Tip: To make things easier, you don’t have to supplement each of these individually. Rather, look for a multivitamin-mineral supplement formulated specifically for seniors, which should exclude vitamin A. Choose liquid formulas if swallowing is difficult or if digestion is impaired. For help choosing products, third-party rating sites like Examine and Labdoor provide unbiased, evidence-based suggestions for the most effective supplements and brands. Macronutrient needs, and the way our bodies metabolizes macronutrients, change as we get older. The ideal macronutrient balance for someone who is 25 may be different from the ideal balance for someone who is 75. As we age, we may develop “anabolic resistance”, which is when protein synthesis decreases. In other words, we need more protein to do the same job. Healthy older people should aim to get at least 1.0 to 1.2 grams of protein per kilogram of body weight per day. Malnourished or ill seniors should aim to get 1.2 to 1.5 grams of protein per kilogram of body weight per day, or more with severe illness. For a person who weighs 68kg (150lbs), that translates to about 80-100g of protein, or about 4-5 palm-sized servings of protein per day. The only caution is in those with kidney problems. In those cases, consult with a doctor, Registered Dietician, or other certified nutrition professional, to determine appropriate amounts. Choose proteins that are soft and easy to digest, such as stewed meats or poultry, soft cooked fish, well-cooked legumes, scrambled eggs, and good quality protein powders. Good quality carbohydrates help meet energy needs and add fiber to the diet, which prevents constipation. Aim to get about 25 grams of fiber a day from soft, easy to digest carbohydrates such as well-cooked whole grains and porridges, well-cooked legumes, well-cooked root vegetables, fruits, and powdered fibre supplements. Fats play an important role in inflammation regulation. Reduce or eliminate trans fats (which tend to be high in processed foods), and moderate saturated fats (like animal fats) and lesser quality omega-6 fats (like corn or soybean oil). Encourage good quality omega-6 (like extra virgin olive oil and avocado) and omega-3 fats (from foods like sardines, mackerel, salmon, herring, anchovies, flax, chia, hemp seeds, and walnuts). Aim for about three servings of fat-rich foods per day, from a mix of quality sources. Tip: Consume a colorful, balanced, whole foods diet. Prioritize nutrient-dense foods first, but don’t be militant about removing all treats; pleasure is important too! There are lots of bottles and potions on the shelves claiming to reverse age, smooth wrinkles, erase pain, and promote longevity. Many of these supplements are poorly researched and may be at best, a waste of money, and at worst, harmful to one’s health. Multivitamin (senior’s formula with low or no vitamin A): Promotes general health; reduces the risk of illness and micronutrient deficiency. Probiotics: Improves digestion and immunity. Fiber: Reduces constipation and helps regulate blood sugar and cholesterol. Vitamin D: Reduces risk of chronic disease, particularly osteoporosis and cancer. Omega 3: Modulates inflammation and contributes to eye, skin, and brain health. Protein & Creatine: Helps preserve lean tissue (muscle and bone mass); decreases frailty. Digestive enzyme: Aids breakdown of food, easing digestion and enhancing absorption of nutrients. Glucosamine: Preserves and builds healthy joint tissue; may reduce pain in osteoarthritis. *Please note that supplements quality can vary greatly. Shop at stores you trust with high product turnover, and look for supplements that are free of artificial sweeteners, coloring, flavoring, and ingredients that you don’t recognize. Don’t be afraid to ask for recommendations from knowledgeable health store staff. Additionally, third-party rating sites like Examine and Labdoor provide unbiased, evidence-based suggestions for the most effective supplements and brands. 7 habits that can help you age well. Luckily, we now have research on the specific factors that can help you live a healthy, enjoyable, meaningful life, longer. In a variety of large-scale population studies, these seven lifestyle habits are consistently correlated with lower disease rates, better mood and well-being, and increased longevity. The earlier you start, the better, but these habits can make a difference no matter your current age. Practice these habits consistently, and transform the experience of aging. For relatively little cost or time (about 30 minutes a day), exercise is one of the most impactful things we can do for our health. As we age, our metabolism declines and our bodies don’t use nutrients as well. circulate blood, nutrients, and oxygen, including to the brain. Additionally, exercise improves mood and well-being. This is especially true if exercise is social, like walking with a friend or attending group classes. When muscles aren’t used, they atrophy: Moving around becomes harder, making it more likely that a person will continue being sedentary. 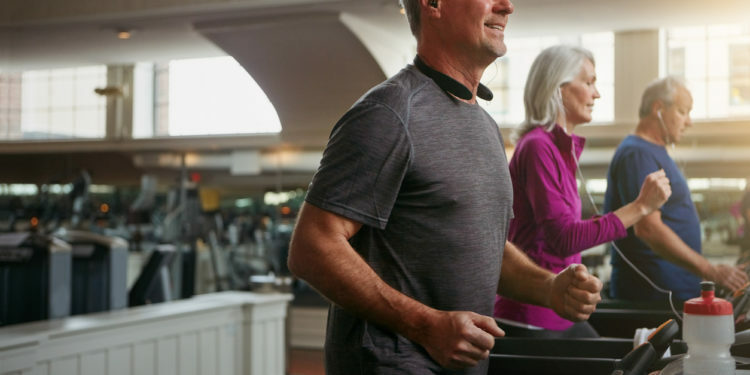 Also, embarking on an exercise program might sound intimidating and inaccessible: Whether due to pain, injury, illness, or just a history of being sedentary, it may be difficult or scary to begin an activity program. Start with gentle activities. This reduces the risk of injury or heart attack. Opt for low impact activities, such as swimming, recumbent biking, or walking on grass or dirt rather than pavement. Even when mobility is reduced or compromised, exercise can be made accessible and can benefit health tremendously. Find an activity that feels fun. And one that can be done consistently. This can include: gardening or yard work, walking, swimming, climbing stairs, yoga, tai chi, cleaning the house, or doing light weight circuits. Keep things in perspective. Remember that “moderate to vigorous” is a subjective measure. What a 25-year-old personal trainer defines as “moderate to vigorous” may be very different from how an 85-year-old beginner exerciser defines it. The right level of activity should leave the exerciser feeling out of breath, but still able to hold a conversation. Ease into exercise. About 30 minutes of moderate to vigorous activity per day is ideal, but benefits appear after only 10 minutes of movement per day! A good program will incorporate some endurance training (like walking fast), some weight bearing activities (like doing bicep curls with soup cans), and some balance training (like practicing standing on one foot, or doing yoga). The foods we eat literally make up our bodies. If we are missing important nutrients, our bodies are more vulnerable to damage or illness. Protein is especially crucial because it helps to preserve valuable lean tissue (muscle and bone). Higher lean tissue reduces frailty, falls, and fractures, all of which are associated with poorer quality of life and earlier death. Antioxidants are like the body’s defense team. Aging is partly due to an accumulation of daily attacks from free radicals from pollution, household chemicals, too much sun, or lifestyle habits like smoking, eating lots of processed foods, or excessive drinking. Antioxidants protect our body from free radical damage, and slow down the aging process. With a regular supply of antioxidants through wholesome meals abundant in colorful plant foods, we’re less vulnerable to cataracts, arthritis, cardiovascular disease, cancer, and more. Aim for five servings of vegetables and fruits a day — and choose a variety of colors! Different colors (red, purple, green, orange, etc.) often relate to different nutrient compounds, so the more colorful the “rainbow” you’re consuming, the more nutrients you’re getting. Poor appetite can lower food intake and the enjoyment of food: This may be caused by medication side effects, illness, or nutrient deficiencies. If a person has frequent digestive upset, they may be (understandably) resistant to trying new foods or eating anything that has triggered them in the past. The individual may have dentures or weak teeth: If dentures are ill-fitting (this can happen after extreme weight gain or loss) or teeth are weak, it can be difficult and painful to chew. It might be harder to shop for or prepare food: Frequent obstacles include trouble walking, carrying groceries, or holding a knife steady due to shaky hands. Energy or mood is low: Fatigue, anxiety, or depression can make it challenging to find motivation to prepare meals. Elderly living alone and eating in isolation are especially vulnerable. Many older individuals no longer have an income: That means the highest quality foods may not be accessible to them. Certain generations may carry strong ideas about nutrition: For example, some may habitually avoid fats, feel they must “clean the plate”, or believe in dessert after every meal, because that’s how they grew up eating. Prioritize consumption of whole foods to increase nutrition. These include fruits and vegetables, legumes, meat, poultry, fish, dairy products, eggs, nuts, seeds, and whole grains. Focus on soft, well-cooked, or pureed / blended foods. Try scrambled eggs, poached fish, mashed vegetables, avocado, yogurt, smoothies, and soups, which are easier to digest. Try food supplements. Protein powders, green powders, fiber powders, and fish oil can be useful for increasing nutrition. Aim to create balanced meals. These should have a protein source, a colorful fruit or veggie, a healthy fat, and a quality carbohydrate at every meal. If budget allows, sign up for a grocery or meal delivery service. This can make food preparation much easier. Choose quick and easy to prepare foods when grocery shopping. Opt for pre-made high quality soups, pre-cut fresh or frozen fruits and vegetables, or pre-cooked proteins. Don’t forget pleasure. Look for ways to increase enjoyment while eating: Choose foods that appeal; set the table with nice linens, silverware, and flowers; eat slowly and savour food; and allow small treats if desired. A small bowl of hazelnut gelato after dinner a couple times a week makes life just a bit more delicious! 3. Achieve or maintain a healthy weight. According to research, there is a BMI “sweet spot” for the elderly. Seniors with a BMI between 25 and 32 have the lowest rates of mortality, and recover better from illness and infection. Being overweight or underweight can pose a risk. Too much body fat can be harmful. In particular, visceral fat around our internal organs is associated with higher inflammation, insulin resistance and high blood sugar, eye problems like cataracts or blindness, kidney damage, and cancer. However, some fat can be protective. Having enough body fat helps a person recover better from wasting diseases like pneumonia, cancer, influenza, and digestive issues. Having some body fat is also correlated with a lowered risk of fracture during a fall. Elderly who are underweight may struggle to gain weight: This can be due to low appetite, which can be caused by medication side effects, digestion problems, or zinc deficiency (which reduces sense of taste and can make food taste metallic). Social isolation is also correlated with skipping meals and eating less nutritious meals. Those who are overweight may struggle to lose weight: Again, medication side effects can contribute to weight gain. Sometimes, seniors are just eating like they did when they were younger — except now, they’re moving less and may have lost metabolically active tissue, like muscle, to use those calories. The onset of retirement and the “empty nest” stage can change eating habits: More leisure time and less routine may mean eating frequently at restaurants, often accompanied by more alcoholic drinks. Ensure protein requirements are getting met first. This macronutrient offers the biggest “return on investment” in terms of staying healthy and resilient as a senior. Healthy fats are calorically dense and can easily increase calorie intake.Choose fats like extra virgin olive oil, coconut oil, avocado, nut butters, and full-fat dairy products like plain whole milk yogurt or aged hard cheeses. Practice mindful, slow eating. And instead of counting calories (which can be annoying to do at any age), measure portions using your own hands! Prioritize whole foods. These include fresh vegetables, lean proteins, and appropriate amounts of healthy fats and complex carbohydrates. Avoid “diet rules” or forcing certain foods. If kale is unpalatable, take it off the table. If you want to have a cookie every now and then, enjoy that double chocolate chunk! 4. Get the right amount of sleep. As we age, it’s normal to need less sleep, and to sleep less consistently. As a result, older people may have trouble falling or staying asleep, and/or may wake early. recovery from stress, be it from emotional or physical sources. In the older years, getting anywhere from 5 to 9 hours of sleep a day may be appropriate. Sleeping enough helps keep us healthy, but sleeping too much can be a sign of illness. If sleeping over 9 or 10 hours is becoming the norm, consult a physician. Excessive sleep can be a sign of nutrient deficiency (low iron and B12 can both cause fatigue), depression, infection, or serious illness. Changing sleep patterns throw people off: Although it’s normal to need less sleep in our older years, it may be difficult to adjust to a new sleep schedule. Side effects from medication interrupt natural rhythms: Some medications may cause fatigue or wakefulness. Worries about health, finances, or loved ones can also keep us up: If tossing and turning is chronic, get a full assessment of what’s preventing rest, including what’s weighing on the heart and mind. Practice good sleep hygiene. Setting up a good night’s sleep doesn’t just happen at night. Turn down the lights and disengage from stimulating activities about an hour before bed. Make your bedroom as dark as possible, and keep it cool (around 67 F / 19 C). Keep a regular sleep schedule. Try to go to bed and wake up at the same time every day. Avoid napping for more than an hour a day, or napping later in the day. Create a comforting sleep routine. For example, have a bath, read some calming literature, or go for a slow walk outside. Avoid spending time in bed while awake. If you can’t fall asleep within 15 minutes, leave the bed and do some restful activities, like reading or making a cup of tea; return to bed when you feel sleepy again. 5. Reduce or quit smoking. To some it may be hard to believe, but many seniors grew up during a time when smoking was promoted as a healthy habit! However, we now know smoking is undeniably linked to negative health outcomes — primarily lung diseases like asthma, emphysema, and lung cancer; and cardiovascular events like heart attack or stroke. Smoking dramatically increases our exposure to free radicals, which increase inflammation, damage the arteries, and advance physiological age. It’s never too late to quit and the body begins to regenerate immediately. Cigarettes are addictive and smoking is hard to quit: If this habit has been maintained for decades, a person may find it hard to imagine their life without smoking. Older people may wonder, what’s the point of quitting now? : This is why it’s important to understand that, no matter what age smoking is ceased, health benefits can occur almost immediately. Take it slow. Smoking is often used as a way to cope with stress. Therefore, rather than simply yanking out this behavior, you may have better luck gradually replacing it with more productive coping mechanisms. Incorporate supportive stress management practices like massage, spending time with friends, or engaging in a creative hobby, and use them to slowly phase cigarettes out. Avoid shaming. Whether you’re trying to quit yourself or helping a client quit, don’t resort to shaming or judgement. It‘s common knowledge that smoking is linked to poor health; a person who smokes needs a sense of hope, not a lecture. The body can regenerate at any age! That’s why there’s still value in quitting, and the benefits can be linked to meaningful goals. For example, being able to go on a long, vigorous walk with a beloved pet while able to breathe freely and clearly. Seek support. Individuals trying to quit may also find benefit in joining support groups, seeking counseling, or trying other medical interventions under the care of their physician. 6. Moderate or eliminate alcohol. Wait a second — isn’t red wine supposed to promote longevity?! The research on alcohol consumption — even moderate consumption — is mixed. Most experts suggest that if you don’t drink already, don’t start. The body can’t store alcohol, so must prioritize clearing it. As the liver metabolizes that scotch on the rocks, the side effect is that it may delay or neglect other tasks — like digesting, absorbing, and storing other nutrients like proteins, fats, carbohydrates, vitamins, and minerals. We want to be careful not to overburden the liver, so it’s free to do all the other important jobs it needs to do. Not knowing what moderate drinking looks like: Many people may be in the “heavy drinking” category without even realizing it. Women: Up to seven drinks per week, with no more than three drinks on any single day. Men: Up to 14 drinks per week, with no more than four drinks on any single day. Increased leisure time may mean increased drinking: Going out to restaurants more often may mean having a nice Chardonnay more often — or maybe even the occasional 9-hole beer bash at the golf club! Alcohol may be used as a coping mechanism: People may drink to blunt chronic pain, loneliness, or anxiety. Replace alcoholic beverages. Try water, sparkling water, or vegetable juices instead. Experiment with other stress-reducing activities. If you’re having more than 1 to 2 drinks per night, and you have trouble stopping, try reflecting on how you cope with life stress. Instead of judgement or lecturing, approach this habit with curiosity and compassion. Consider replacing drinking with spending time in nature, getting together with family, or playing with a pet. Don’t go it alone. As with smoking, people trying to quit or reduce alcohol consumption may also find benefit in joining support groups, seeking additional counselling, or trying other medical interventions under the care of their physician. When people are surveyed about the most meaningful aspects of their lives, they list good marriages, close family relationships, rich friendships, and lively work relationships. Often, it’s the presence of other people, to love and be loved by, that enhances our reason to live. Elderly who live in isolation are also most at risk for physical and psychological problems. Living alone may mean that there is no one to help if you fall, no one to talk to about joys or sorrows, and no one to help prepare food. As a result, elderly living alone may be more prone to injury, loneliness, and malnourishment. All of these factors reduce lifespan, and more importantly, quality of life. makes life more fun and joyful. Prioritize and enable regular connection with family, friends, and community members. As age increases, individuals are more likely to experience loss: You lose a chance to connect when you lose friends, family members, beloved pets, or a spouse (which is especially correlated with a sharp increase in mortality). Living in a long-term care facility can be isolating: This can be especially difficult if social connections are not nurtured and enabled. Eating in isolation is a red flag: When people eat alone, meals tend to be more repetitive, simple, and less nutritious. Stay as independent as possible, but still highly connected. This enables both autonomy and support, which means experiencing plenty of meaning, richness, and joy in the later stages of life. Even if an individual has lost a loved one (or many), quality social connections are available and can be developed. Prioritize social activities. Options include family potlucks, group fitness classes, bird watching meet-ups, live theater field trips with friends, or taking a course in a creative or intellectual endeavor with other like-minded peers. Mix generations. Although the elderly may appreciate spending time with people of their own generation, younger generations can provide energy and newness to an elderly person’s life, and an elderly person can provide wisdom and perspective to a younger person’s life. Reflect on your life, then take action. My two sets of grandparents were very different. One set had poor lifestyle habits, suffered from chronic disease, and died in their early seventies in a nursing home. The other set stayed active, kept a vegetable garden that fed them many meals, and lived in a close community where they were able to help and be helped by neighbors and friends. This set lived well and independently on their farm into their mid-nineties. When I think about my two sets of grandparents, I see the range of possibilities my genetics offer. Mostly, I see how powerfully lifestyle habits can affect quality of life. There are lots of things we don’t have control over. But we do have control over many habits that have tremendous impact on our health and how we age. I don’t aim for perfection, and don’t advocate anyone else does. But I do advocate for being proactive. If you’re aging — and, ahem, that’s all of us — reflect on your family history, and your current habits. Consult the above list and focus on one thing to promote your healthspan. Practice that habit, and add more when and if you feel ready. All positive actions count, and no healthy step forward is too small. If you’re a health professional, help your elderly clients or patients take action on these habits. Acknowledge the real-life constraints they have, but more importantly, highlight their strengths. The elderly have superpowers too — they made it here this far, after all! And for everyone: You have today. What can you do to make the most of it? The later years are a great time to clarify what’s truly important. It’s ok to let go of possessions, tasks, and even relationships that no longer bring you joy and meaning. If you have the means, hire help! Get a trainer to help you move safely and regularly, a meal service to ensure your nutrition needs are being met, or a local youth to take care of minor house repairs and chores you no longer want to do. This allows you to spend more time on the things you enjoy, hopefully with the people you really love spending time with. Social interactions and good relationships give us purpose, joy, and connection. Connection with others is also linked to better physiological health. Find like-minded people to connect with regularly, be it with classmates from a course you take, family, or just your neighbors down the street or down the hall. And don’t be afraid to connect with the younger generation! If you’re not a grandparent by blood, you might be able to volunteer as one! Rather than resist it, learn to embrace it. Support whatever changes arise with compassion, openness, and resilience. Many people find that developing a spiritual practice is nurturing during times of intense change. This practice can be anything that supports you and brings you peace, whether it’s a daily walk in nature, regular time with a loved one to talk out hopes and fears, or a mindfulness practice like meditation or deep breathing. 4. Emphasize joy and meaning. Find ways to incorporate pleasure into your daily life. Choose foods that you love and can savor. Get a massage or enjoy a special spa treatment. Read books that spark your curiosity and fill your heart with joy. Do something you’ve never tried but you’ve always wanted to do. Appreciate the beauty around you, whether it’s the light in a child’s face or the bright colors of your flower garden. One of the best ways to feel good is to give to others. As an older individual, you have a lifetime of perspective and wisdom that you can share with others. Donate to charity, volunteer, or teach others something you’ve learned in your life. This could mean helping tutor adults in math at your local community centre, or teaching a younger family member how to make the famous family pierogi recipe. Think of the legacy you want to share, and give it generously. 1. Do a full assessment of your clients’ health status, needs, wants, and situation. Look at your client or patient holistically and in context. Find out what and how they’re eating, what they do (if anything) for activity, what their living situation is like, what kind of support they have, where their mood and motivation is at, and what they do for fun. If you don’t have access to a lab, work with an individual’s family doctor to get blood testing done to ensure that there aren’t any obvious nutritional deficiencies or abnormal blood markers. Avoid “one-size-fits-all” prescriptions. There is no one “protocol for healthy seniors”. Just as in other stages of life, every elderly person is unique. 2. Focus on the positive and what can be done. Working with the elderly may mean working with some limitations. While these limitations should be respected, they shouldn’t be the focus. Instead, focus on what a person is ready, willing, and able to do. Add habits that are simple and provide easy “wins” for your client, which can help restore confidence and optimism. Focus on doing the basics, consistently and well, to add a sense of autonomy and to improve quality of life. Adding 10-30 minutes of movement per day. 3. Treat the elderly with dignity and respect. Like all clients, assume they are the expert. Chances are, they’ve been on the earth much longer than you, and have made it pretty far on their own. So don’t boss them around. As a health professional, you are there to provide information and support. Offer guidance but also offer options. Make it clear that the reins are in your client’s hands. 4. Know your scope of practice. Work with other health care providers if your client or patient is facing issues you are not trained to deal with. When appropriate and with consent, connect with a person’s family doctor, or other health professionals on their team. Working together, you can all help to best serve a person in their quest to live a long, meaningful, healthy life.